This week, I decided to feature a type of bread that many people hardly even consider to be “bread” in the first place: the pancake. And truthfully, I don’t exactly consider the typical fluffy and sweet American pancake to be bread either (there’s a reason why we call it “pancake” and not “panbread”). But other types of pancakes (unsweet, mind you) most certainly are bread; there is but a fine line between a flour tortilla and a savory crepe. The main difference is the amount of liquid used, requiring different methods of cooking. So this week, I’m featuring savory pancakes from around the world, some familiar, some not, but all basically just flour mixed with liquid and cooked on a hot, flat surface. 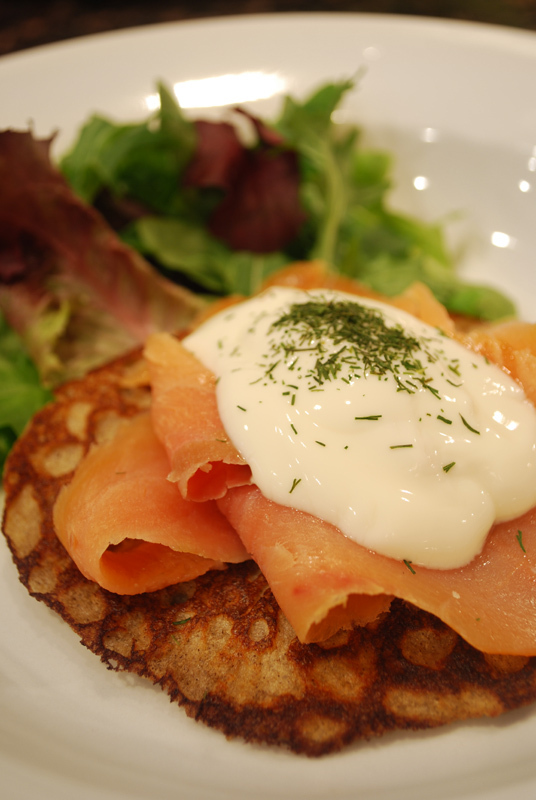 First up this week is a textbook savory pancake: the Russian blini. You’ve perhaps come across miniature blini at a posh cocktail party, hidden under a dollop of crème fraîche and topped with caviar or smoked salmon. And while those are traditional accompaniments, blini are generally larger and thinner in their native land. 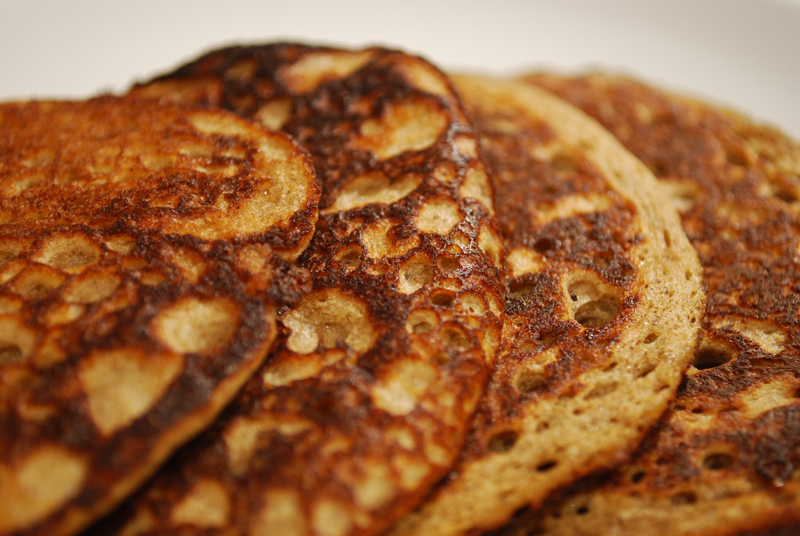 The main defining characteristic of blini are the use of buckwheat flour, and that they are yeast-risen. Many traditionalists will insist that to make them otherwise renders them squarely in the realm of “crêpe” or “blintz”. In Russia, blini are closely associated with Maslenitsa, the week-long, pre-Great-Lenten Butter Festival. Also called “Pancake Week”, Maslenitsa is a kissing cousin to the more familiar Carnival, or Mardi Gras celebration. The Orthodox Great Lent falls at a different time than the Western Lent, though, so the two don’t generally coincide. As dairy products and eggs are among the forbidden foods during Lent, blini represent the last chance to enjoy such fare. Made with milk and eggs, cooked with butter, and served with sour cream and more butter, they are off limits for the next forty days. During the festival, blini may be served at every meal, with caviar, salmon, herring, and many other toppings, which generally become more humble as the week progresses. Blini are also said to represent the round Sun, a holdover from an ancient Pagan festival dating back as far at the 2nd Century, A.D. After the 6-month Russian Winter, it’s understandable why they would be lauding the sunshine! After the rise of Communism, the religious aspect of Maslenitsa was done away with, but people kept on celebrating “Pancake Week”, mainly to get together for platefuls of blini. Today, religious tones have crept back in to the celebration, but the blini remains firmly in the realm of the secular, enjoyed by nearly everyone at all times of the year. As a side note, the word “blini” is a Westernization of the Russian word “blin”, which means “pancake”. When referring to blini in English, native speakers of Russian will usually translate the word and say “pancake” instead of “blini”. Interesting! Though blini and Beluga caviar are as natural and expected a pair as tomatoes and basil, they are often served in Scandinavia with any type of fish roe, from whitefish to trout to salmon to herring. They are typically accompanied by chives or diced onion, and sour cream and melted butter. I’m not sure if beer is a traditional ingredient in blini (it is not), but I liked how the malty flavor complemented the buckwheat flour. I used a Bock (Leinenkugel’s 1888 Bock, to be exact), which is not as heavy as a stout, but has a more robust flavor than your standard lager. I served these for dinner with smoked salmon topped with plain yogurt and dill, with a little salad on the side. They were delicious, but the store-bought salmon made me wish I still had some home-cured salmon in the freezer. If you’re having a party, blini or not, you should absolutely try curing your own salmon sometime. It’s so, so easy, and far better than anything you can buy. Cheaper, too! And since the point of curing is to better a piece of inferior fish, you don’t have to go to much expense. I’ve seen sides of salmon at Costco for well under $20, and you end up with pounds of cured fish. Try it sometime! You can thank me later. 1. Sprinkle the yeast over the milk. Whisk in the buckwheat flour and mix to form a smooth paste. Cover and set aside to rise in a warm place for 1 hour. 2. Add the bread flour, buttermilk, beer, and egg yolks. Whisk just until smooth. Cover and set aside in a warm place to rise again for 1 hour. After the second rising, the batter may be refrigerated for several hours. 3. When you are ready to cook the blini, whip the egg whites with the salt and the sugar until stiff but not to the point where dry peaks form. Fold gently into the batter in three installments. Preheat the oven to 200º F, and leave a sheet tray on one of the racks. 5. Cook for about 4 minutes on one side, then flip and cook 1 minute on the other side. You can usually judge when they are ready to turn by watching the bubbles as they form on the surface. Brush additional butter on the skillet as you turn the blini, if necessary to avoid a dry appearance. Transfer blini to the sheet pan in the warm oven to keep warm while cooking the remaining ones. 1. As soon as the top of the blini start to look dry, and the bubbles look like they’re setting, they’re ready to flip. But if they start browning too much, turn your heat down a little, and flip those suckers over! 2. My blini were cooking properly at a constant medium heat, but depending on your pan and your stove, you may need to adjust the heat. 3. Oh, and I hope you like blini, because this recipe makes a lot. I know mine were a little bit smaller than 4 1/2 inches; but good lord, I ended up with nearly 40. If you’re making miniature ones for a party, this one recipe will provide you with all the blini you’ll ever need.